Topic: PV Solar Panels Ireland: In Pictures. Click below to view a solar panel installation in pictures. These Solar PV panels were installed on a factory in 2017. We put together a few pictures from the installation in a brief slide show to illustrate how an installation takes place. This is a 130kWp system. 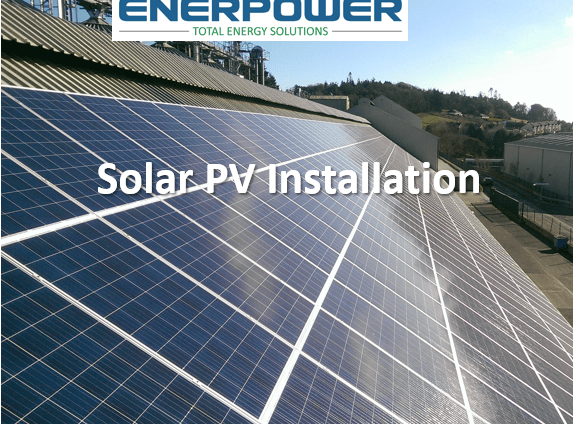 Click here to learn more about installing Solar PV to your business. Have you ever wondered how Solar PV panels are installed on to factories – click below to watch a short video showing pictures from an installation of a 130Kwp system which was installed in 2017. By installing a Solar PV array you are guaranteeing huge electricity savings and ensuring that your business improves its Building Energy Rating (BER). With Enerpower’s solar products, you can protect yourself against inevitable price rise from energy suppliers and guaranteeing output for 20 years with no maintenance costs. When you install a solar power system, the solar panels kits will work on sunlight rather than heat from the sun. Even during the cloudy days, your solar power kit will gather enough energy to power your business. The main benefit of solar energy is that it does not produce any pollutants and is one of the cleanest source of energy. it is a renewable source of energy, that requires low maintenance. When you install solar electricity, you will begin to harness the energy provided by the sun using that solar technology. A solar pv system will work on the sunlight, rather than heat from the sun. Even during the cloudy winter days, your solar power system will gather enough energy to power your business. As well as free electricity when you install a solar pv array, you will get a 10 year manufacturers warrants as well as payback in approximately 5 years.